Good product for the price. Very easy to use eg. entering in names and numders in the Dir. The easy-to-use C200 is an ideal solution for those with a mild-to-moderate hearing loss. With up to 30 decibels of amplification, the C510 is an ideal solution for those with a mild-to-moderate hearing loss. 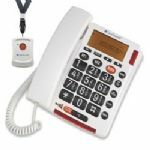 The Clarity Professional® C2210™ amplified corded phone, featuring Digital Clarity Power™ 3.0 technology, provides intelligent amplification to make soft sounds audible while keeping loud, sudden sounds bearable. With up to 50 decibels of amplification, the C2210™ is an ideal solution for those with a moderate-to-severe hearing loss. Designed for persons with a moderate hearing loss or low vision. Ideal for home and office use. Designed for persons with a severe hearing loss or low vision. Designed for persons with a moderate-to-severe hearing loss or low vision. Ideal for home and office use. Corded or cordless? Now you can have both in one unit. The A1600 ClearDigital DECT 6.0 features a corded speakerphone and a cordless handset for unparalleled flexibility. After just one day, you won't want to use any other phone in your house. Great phone, simple design, top value, 40 dB amplification with full range tone control. Eight prominent speed dial buttons let you display photos of the people you call most. When it comes to the CSC600, the question isn't what features does it have, but what features doesn't it have? The most powerful tone management, ergonomic design, low energy usage. And that's just for starters. Emergencies happen. That's why we offer the Amplifying Emergency Connect Speakerphone. Auto-dials up to 5 pre-programmed numbers, lets you record an outgoing emergency message, and more. Also comes with a wrist pendant. A phone that talks to you and never asks for an answer. The CSC1000 announces your caller's number and displays it on Caller ID. Additionally, when you're doing the calling, it tells you which numbers you've pressed. Think of it as your personal assistant. A remote control pendant makes this phone unique and ideal for those wanting fast and easy dialing in the event of an emergency. The pendant dials up to 30 emergency numbers at the touch of a button to deliver unmatched safety, security and peace of mind. It also offers all the amplification (up to 400x louder than a standard phone) and convenience you need with it's talking functionality. The Fanstel ST150 is a sophisticated amplified business speakerphone that can digitally adjust frequency-specific volume levels so that any user, especially those working in extremely noisy environments, can comfortably and clearly hear a caller’s voice. 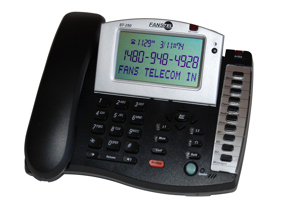 The Fanstel ST250 is a sophisticated 2 line amplified business speakerphone that can digitally adjust frequency specific volume levels so that any user by up to 50 dB, and the internal chamber of the speakerphone delivers a crisp acoustic experience normally associated with the highest end conference speakerphones.